This topic is for discussion, observations, fotos & videos of Nest#24. The Nest #24 Nest Tree is visible from the Co-Op & from the four way stop sign corner. It is across the road from a family campground that is very busy in the summer. Also very busy, is the road that goes past the Co-Op & down to the trail to Tribune Bay Beach, a very popular destination on Hornby. 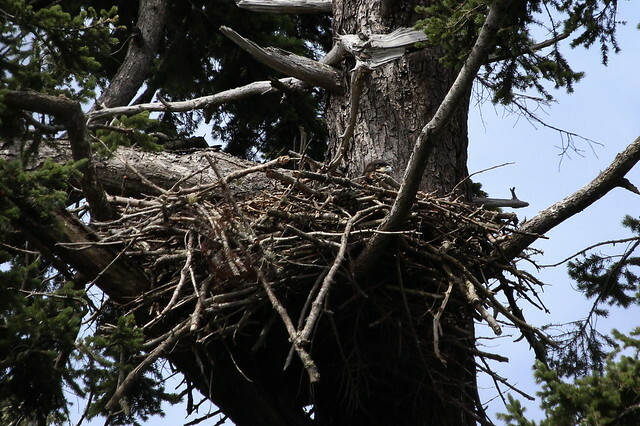 Last season, there were two Eaglets in this Nest. One was found grounded after a premature fledge or slip, by an Eagle lover who works at the Co-Op. This Eaglet was rescued by HEART, & shipped to Mountainaire Avian Rescue Society - MARS. To build up their wing muscles, they were sent to Orphaned Wildlife Center - OWL. When ready for release, they were shipped back to MARS. Read more about last year*s season at this Nest here. Click here to read about the 2012 season on this Nest. Click here to read about the 2011 season on this Nest. Click here to read about the 2009 season on this Nest. Click here to see winterwren*s gorgeous map of Hornby Island & the Hornby Nests, so that you can see where it is. i noticed late fall that the Nest #24 Tree has lost it*s gorgeous, characteristic curved top that the Eagles liked to perch on. I went to check this nest on June 21. 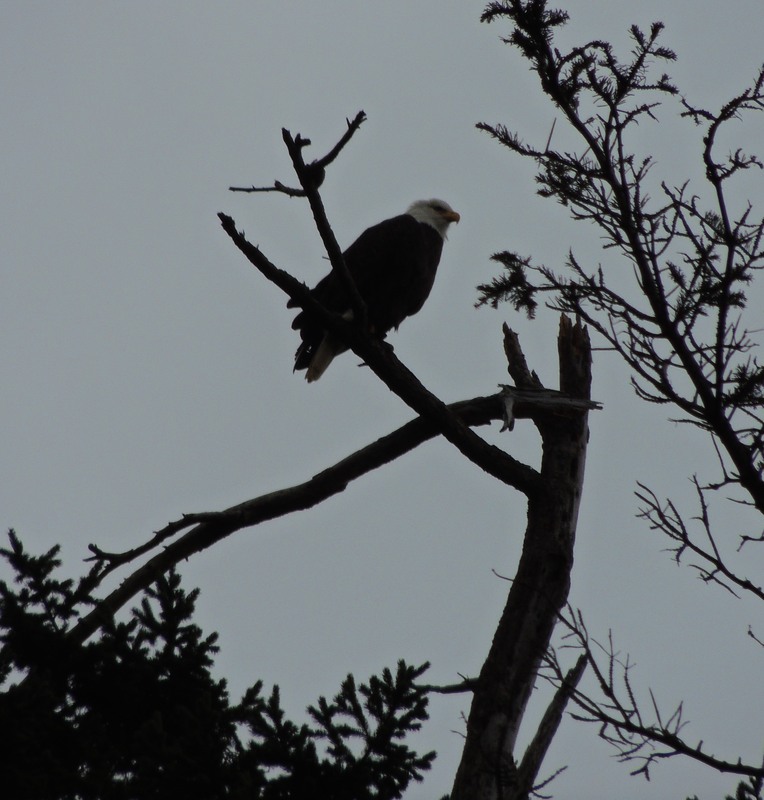 At first I saw and heard nothing, though when I go to the Co-op I often see an eagle perching atop the nest tree. So this was the view of nothing much from my favourite viewing spot. I went looking for different angles on the nest... Then while I was thrashing around the bush I heard "screep screeep screeeep THUNK!" Someone had landed on the nest! And these were two different screeps I was hearing! Ran to my first viewpoint, missed the adult, but this is what I saw. By the time I had my tripod set up again, the leftmost eaglet had disappeared below the rim again. But I got some nicer shots of the other one's cute face. At mid-day today I got home to find a phone message from MARS! I was soon on the phone with one of the volunteers there; she told me that a grounded eagle had been seen near this nest, and that people were trying to keep that eagle from going onto the road. This is a very busy little road in the summer, because it leads to a campground and to the largest beach on the island. I phoned the campground caretaker and she confirmed what I already suspected: an eaglet had dropped down from Nest 24 too early, just like last year! So I reported back to MARS that we were dealing with an eaglet, and was told that if that was the case I should capture him. By the time I spoke again to the campground caretaker, someone had already caught the eaglet and put him in a cardboard box! But the box was too small and the person had to stay there in the rain and hang on to it. So I got my gear as quickly as I could and went over, without my camera unfortunately. So there are no pictures of this lovely eaglet. He looked quite small to me, so I'm thinking he's a male. His wing feathers look fully formed but he has a small band on the front of his body where his feathering is incomplete, and you can see the woolly second down through. His feet look too large for him, and the toes seem awkward and bent wrong; I was worried about that until Sandy from MARS told me that this is how they look at that age, before they have spent a lot of time perching. So this little fellow seems to be a bit younger than the other eaglets we have rescued. 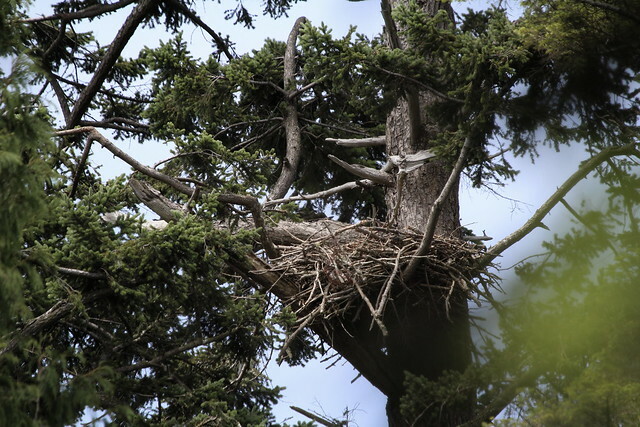 There is another eaglet on that nest. 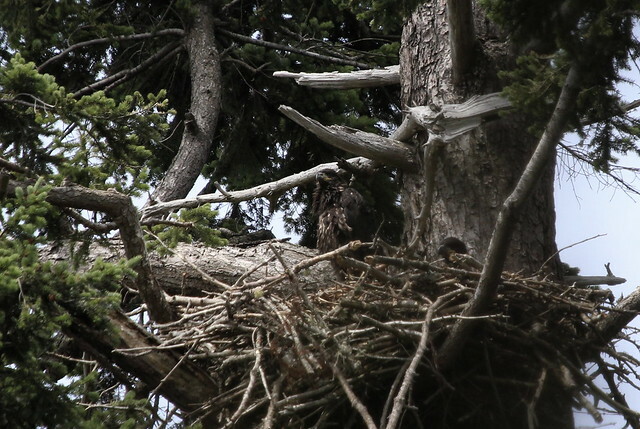 Their Mom was circling around and calling while the grounded eaglet was still visible, and the people who captured him said that he called back to her. When I got there, they had made a little enclosure in the yard and he just stood there, way too docile. I had a quick look at his wings and got him in the carrier. I wonder if it was the younger age, or starvation or disease that made him so tame. Hopefully we will find out soon. I took the next ferry, and handed him over to our dear volunteers from MARS at Buckley Bay. He is now in care, and hopefully he will do well and fly strong soon! wren, many thanks for another rescue. Thank you once again, Wren! Thank you for taking care of the eaglet. I hope "he" does well. Way to go Wren and everyone at the Tribune Bay campsite. Okay, the story of this Eaglet continues on the MARS topic here. Meanwhile, Camper's sibling is alive and well. I was at the Co-op store just now and heard some gulling from the direction of the nest, down the road. I could see an adult perched at the top of the nest tree. Then I heard some good loud squeeing! I'm thinking Little Miz Camper and her Mom must have been watching Dad Tribune chasing after some tasty morsel. This remaining eaglet sure has a good pair of lungs. Just now, a few minutes ago, I was near this nest and heard that good loud screep again. I looked over and there was Camper's sister, fleaping crookedly from branch to branch, teetering crazily at each landing, until she reached the very top of her nest tree! Some of the people who work at the Co-op have been watching her; they confirmed that she has been doing this for a few days but has not yet taken a real flight. Still, it's quite a way up! She looked very proud once she got her balance and settled on the highest point of the tree. Way to go, Camperette!♥ And thank you, Wren, for keeping us posted.